Have you ever seen those videos of cats freaking out before taking a bath? If you look on Youtube, there are dozens of those and it ain’t pretty. 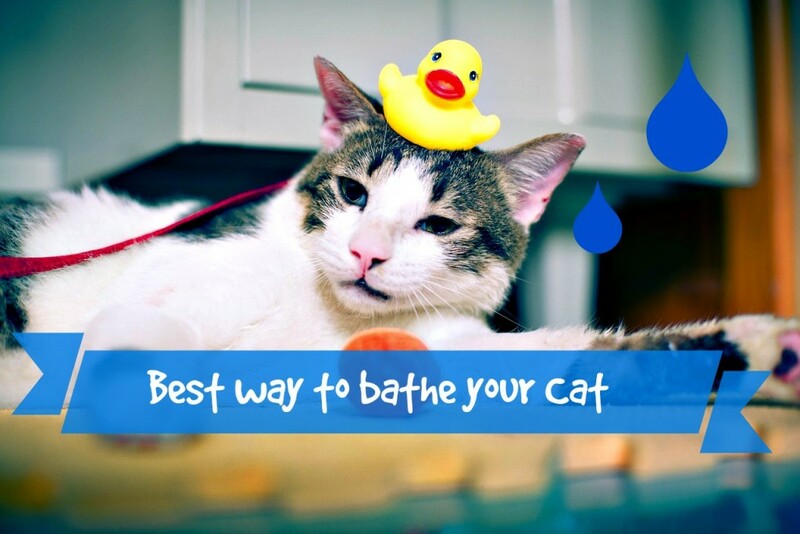 Do not be fooled by those, though it is often not easy to bathe a cat, it can be manageable without ending up in a blood bath (check out the video of our good boy Yoda at the end of this article). The key is patience and training. If kitty needs a bath, he will get a bath. It will require some skills but you can do this. Who’s the boss?!! Why would my cat need a bath? Cats are self grooming creatures but there are several reasons why your cat cannot clean himself and would need a proper bath. 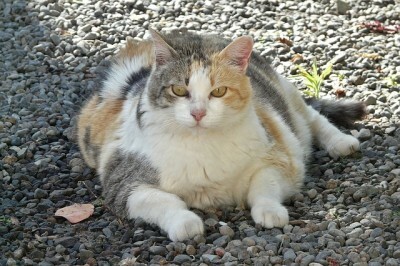 Your cat is too old or disabled: his joints ache and he is no longer the young flexible cat he used to be. He is too fat: he cannot reach some parts of his body. Sometimes cats find it hard to maneuver to clean themselves when they have a chubby belly. He is sick or depressed: sick or depressed cats tend to show their distress by neglecting to groom themselves. If your cat seemed to stop grooming for no obvious reason whatsoever, try to identify if something changed in your home that might have upset him and/or if he is having an abnormal behavior. The best way to check is to go to the vet. He will help you identify what is the cause and treat it properly. No need to give a bath to a sick cat, if you do not treat the cause instead of the obvious signs, your cat will keep on being dirty and the situation could worsen. Sink / plastic bucket or any type of container that could fit your cat (best is to have 2 recipients, one for shampooing and one for rinsing. Make sure your cat’s nails have been cut beforehand. If you haven’t done so, it’s a good thing to do in order to avoid a massacre, especially if you know your cat does not like water. Check out how to proceed here. Make sure the shampoo is within reaching distance. Once your cat is in the water, it’s gonna be hard enough to keep him there so make sure everything is handy. Turn on the water (lukewarm) and let it run in the bucket(s)/sink (whatever you want to use). You can adjust the amount of water if need be – we recommend to have just enough water so that you can use your cup to get the water on your cat. 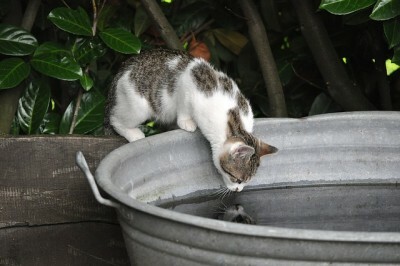 It’s a good idea to use a second bucket ready so as to have some clean water to rinse your cat after the shampoo. As you bring your cat closer, reward him with a treat. It’s crucial to make your cat enjoy this experience a little bit so he associates it with some positive thoughts for the next time (yep, cause there might be one 😉 ) . If your cat is already feeling the trap and trying to escape, gently hold the scruff of his neck. It’s the most natural way to calm down a cat and reminds them of the way their mommy used to carry them around. Now take your cat and gently put him in the bucket/sink. Try to talk to him in a reassuring way. Give him another treat and pet him. Fill up the cup and slowly start pouring the water on your little beast. Always be careful not to put water in their ears as those are very sensitive to infections. If you need to clean your cat’s ears, go here. Do not forget to keep on reassuring your cat and petting him as much as possible giving him a treat now and then. The more comfortable he will be, the easier it will be for you to finish the job. 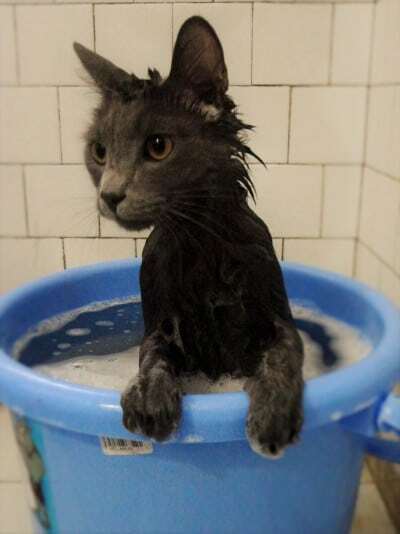 When your cat is all wet, you can start using the shampoo. Rub it in, massage your cat, try to make him feel good and show him that it’s not as terrible as it seems. When he is well soaped, it’s time to rinse. Transfer him to the second bucket and gently pour water from his spine along the sides working your way down. You will slowly eliminate the remaining shampoo. Now gently take him out of there and wrap the towel around him. Try to dry him off as well as possible. Torture is almost over even though your cat probably hates you by now. Before finishing the bath session, give him another treat and congratulate him on his patience and efforts. Let him run free and enjoy his fresh new furrrrrr! In the wild, you will rarely see a cat take a bath in the river. As for anything that’s not very natural for your cat, you need to practice early. Younger cats can adapt better than older ones and if you practice early enough, your cat might even come to enjoy it. Yoda was less than 2 years old when he caught fleas. For that reason we had to give him a proper bath and I have to say, it went surprisingly well. You can check out this tremendous achievement right here 🙂 Enjoy! 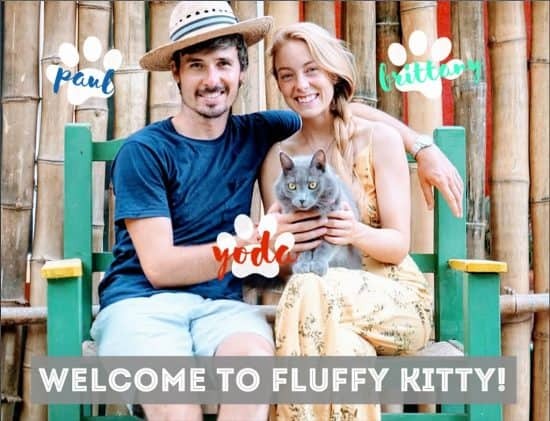 Thanks again for following us on Fluffy Kitty, check out or other articles and leave us a little comments if you enjoyed what you found. Next Post My Cat Had Kittens Can I Move Them? Why do cats eat dirt ?